The ancient book Lal-quitab was originally from Persia, Iran now. Remedies suggested by this red book are easy and effective. I will show you all, how the remedies are given and how my clients got relief. These remedies are cheap and within the reach of the common man. Case 1 : How to get a child? This the horoscope of a lady born 8-8-1954, at 9:00 A.M. at Kalka. See, the fifth house for children is under affliction by three out of the five natural malefics. (i.e.) Ketu, Rahu and Mars (8th aspect). The fifth lord, Mercury is aspected by the hot planet, Mars. This lady had not conceived for the last fifteen years and the doctors declared that her uterus was not fully developed. She was advised to punch one copper coin daily for five days (five coins in all) with a hammer and nail. She was advised to drop the punctured coin in a flowing river. She conceived in a month. She gave birth to a male child on 5-1-1991. Case 2 : How to keep a job? 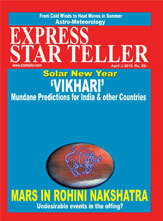 This is the horoscope of a lady born on 13-2-1995 on 13-2-1995 at 5.27 A.M. at Lucknow. Saturn is in the tenth house. 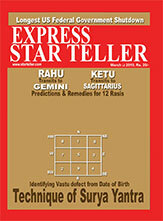 According to the Lal-Kitab, Saturn in the tenth makes the horoscope blind (i.e.) the native never gets the award of the talent possessed or recognition for the services rendered. She was working as an adhoc lecturer in a degree college in Lucknow. Some vacancies were advertised by the commission and she applied for it. She was rejected for another candidate. She wen t to the courts and lost. The lady in question who was selected in her place reported to duty on Friday. The lady who lost the seat requested to her successor to join two days later, (i.e.) on Monday. Then she sought the help of the Lal-Ketab. Do Ganapathi Darshan for ten days to counter the affect of Saturn. She should drop four almonds daily for four days at a fixed time in a graveyard. She was asked to start the remedies immediately. When the new candidate arrived on Monday, she offended the Principal and the manager. She was told to leave. The lady who did the remedy was reinstated back. Case 3 : How to Save your marriage? This is the horoscope of a lady born on 18-8-1953 P.M. at Varanasi. The seventh house lord, Moon, is debilitated. Mars a natural malefic occupies the seventh house. Her family life was disturbed and she opted for a divorce. Since the case was lingering for two years she approached the Lal-Kitab for an early divorce settlement. She was told to put four almonds daily in a cremation ground. In the next hearing the boy came with a compromise formula which was accepted by her father and her. Now both of them are living together. A divorce was averted. Case 4 : How to choose the Right Partner? This is the horoscope of a lady who is depressed and disappointed as her parents were against her marrying her boyfriend. She reached out for the remedial measures in the Lal-Kitab. To punch a copper coin with a hammer and nail and throw the coin into a flowing river. We assured her that whatever she decides, the next day, her parents will happily agree. The next day she changed her mind and decided to marry the boy her parents choose. Case 5 : How to get a son? The horoscope belongs to a lady doctor. She has two lovely daughters but she desperately wants a male child. The beds are to be placed in a North/South direction, The head towards the South and the feet toward the North. She was advised to eat green moong or ladoos made out of it daily. All creepers and weeds to be removed from the lawn. Also, flowers with feminine name should not be in the garden. Since Jupiter is the lord of the fifth house, growing Marigolds will be helpful. The months, January and March 1989, were good months for conceiving. She gave birth to a healthy male child on 21-10-1989.